Invited to show this mini-collection at Pitti Uomo in Florence, Gareth Pugh accepted the challenge to create a show outside both his geographical homes of London and Paris and his aesthetic comfort zone. The collection, previewed by Dazed ahead of the Thursday evening film screening in a 14th century church, consisted of six elaborate outfits that shone in gold and cobalt blue. Immensely influenced by Florence, Pugh looked at ancient Italian architecture and religious iconography for inspiration. A few pieces in wet suit-like neoprene, high collars and angular tails reminded us of the classic Pugh look, while a floor length tight evening dress in slashed dance wear fabric kept everyone on their toes. A short dress in gold mirrored plastic, a black top with a blue cape and flared gold trousers continued the collection, which Pugh said was dedicated to Florence and fine art, such as Caravaggio's paintings. "I like the idea of mixing hard with soft, masculine with feminine and light with dark. And for this show I wanted create the notion of a figure emerging from darkness into the light", Pugh said before the screening of the film he made together with long-time collaborator Ruth Hogben. In two sessions, Pugh welcomed the crowds to enter his fourth-floor venue. With its high ceilings, lit candles, observing saints and dimmed lights, Orsanmichele was the perfect spot for Gareth Pugh's Pitti Uomo film. High in tempo, full of movement and packed with special effects, the clip left no one untouched and its sartorial hints towards Pugh's March catwalk show in Paris made everyone leave satisfied in every way possible. Dazed Digital: You've mentioned that the blue and gold comes from religious iconography in Florence, but what and where specifically? Gareth Pugh: There are just loads of gold gates and incredibly rich golden tones all over Florence. And gold is very Italian for me, you know Versace, Cavalli and excess in general. The blue is something very pure and symbolic within religious paintings. For me it was also about the femininity within the religious iconography. Gareth Pugh: Yes and the film screening tonight will show just that, the new meeting the old. The space is very old ancient building and we've transformed into ours for a night, mixing modern with ancient! DD: You've worked with new colours, but is there also an new shapes, structures or techniques in this collection? Gareth Pugh: People don't really know me for long glamorous evening dresses! But it's made in a really stretchy fabric so you could go swimming in it. Daphne Guinness always says that her ideal garment is an evening dress that she can swim in and wear out in the evening... so this is the one! DD: Does showing a collection as a film or on a catwalk change the design process for you? Gareth Pugh: The floor length dress because it's so different for me, and I like the detachable arms that I originally did for Nick Knight but that I have brought out again in gold for Pitti. 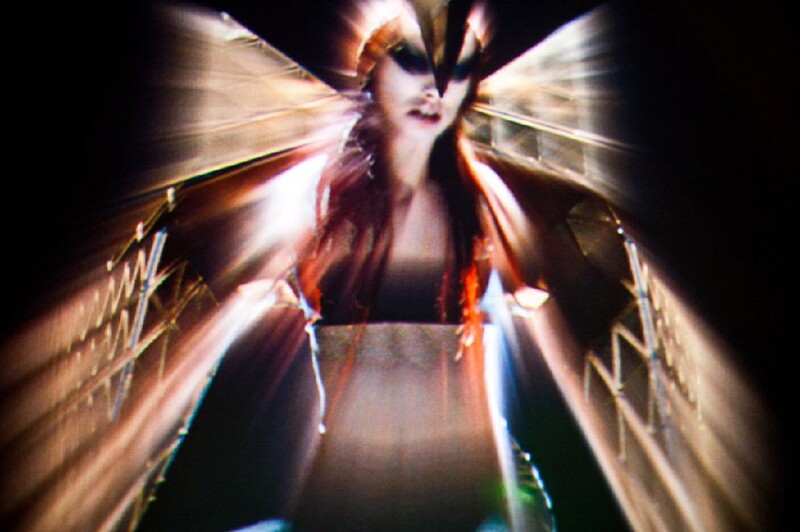 View the full Gareth Pugh film for the A/W11 Pitti show here.